Context - We review the scientific literature regarding the health risks associated with occupational exposure to pesticides. This is a faithful summary of the leading report produced in 2013 by French National Institute of Health and Medical Research (INSERM): "Pesticides : Effets sur la santé - Une expertise collective de l’Inserm "
In this report we review the scientific literature regarding the health risks associated with occupational exposure to pesticides in France, with an emphasis on pesticide use in the agricultural sector and on the effects of pesticide exposure upon fetuses and young children. The term “pesticide” comprises an extensive and highly disparate array of substances serving to eradicate, control, or repel living organisms considered harmful or otherwise undesirable. Such organisms include insects, vertebrates, worms, plants, mushrooms, and bacteria. 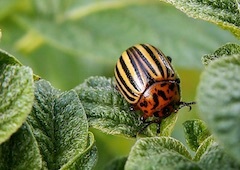 Pesticides do not operate with absolute specificity, attacking only a single type of pest. Instead, products intended for one particular pest typically display levels of toxicity against a fairly wide range of additional organisms whose physiological processes and mechanisms happen to overlap with those of the target pest. There are some 1000 pesticides on the market. Of these, 309 are currently authorized for use in France, where they are available in nearly 10000 different commercial formulations, both liquid and solid (e.g., pellets, powders). The active ingredient in the most commercially successful pesticides is either sulfur or glyphosate (an herbicide). In terms of quantity, the majority of pesticides (90%) are used for agricultural purposes. 80% of these products figure in the cultivation of small-grain cereals, maize, and rapeseed, as well as in viticulture. Fungicides in particular constitute nearly half of the pesticides used in agriculture. Pesticides play a role in other occupational sectors, too, including road, garden, and park maintenance and the manufacture and treatment of wood products. They likewise have applications in human and veterinary health initiatives; examples include mosquito or rodent control. Pesticides also have important household uses: they can check destructive plants or animals, eradicate insects, and assist in the maintenance of gardens or woods. 1 The information on page 863 of the full report is particularly relevant. How does pesticide exposure occur? Pesticides are omnipresent in the environment: they can be found in air, water, soil, and foodstuffs. However, organisms eliminate with relative rapidity most of the active ingredients currently used in pesticides. For the population at large, exposure occurs chiefly via dietary intake. 2 For instance, “the largest, most significant increase in the risk of leukemias – an increase of 43% – is associated with workers in the pesticide production industry.” See page 884 of the full report. Do pesticides cause cancer ? Cancers of the blood: Workers exposed to pesticides exhibit an increased risk of lymphatic and bone marrow cancers. Organophosphate pesticides and certain organochlorines (lindane products, DDT), currently banned, appear to be responsible. An elevated risk of leukemia has also been reported, particularly among children exposed to pesticides while in utero; however, the data here are less conclusive. Overall, the reported risk of adverse health effects associated with pesticide exposure is greater for women than for men. Prostate cancer: Agricultural workers, workers in pesticide production plants, and rural populations all exhibit an increased risk of prostate cancer. Chief among the pesticides linked to these cancers are chlordecone, carbofuran products, coumaphos, fonofos, and permethrin. Members of the carbamate family (butylate), a group of pesticides currently banned from use, may also be implicated. In the case of certain pesticides, the increased cancer risk appears to pertain only to agricultural workers with a family history of the disease. Other cancers: As regards other cancers, e.g. testicular or brain cancer or Hodgkin’s disease, data analysis is hampered by the relative paucity of cases. The presence of additional variables further complicates any interpretation of the data: the agricultural community, for instance, experiences considerable exposure to the sun’s ultraviolet rays, which in turn increases its risk of melanoma (skin cancer). Do pesticides cause neurodegenerative diseases? An increased risk of Parkinson’s disease has been observed among individuals occupationally exposed to pesticides, and some studies also point to an increased risk of Alzheimer’s disease. Additional research is required in order to determine whether there exists a comparable link with Charcot disease (also known as amyotrophic lateral sclerosis or ALS). Furthermore, several studies have shown that occupational exposure to pesticides (organophosphates in particular), especially at high doses, does affect cognitive function. Can pesticide exposure affect the course of pregnancy or fetal/child development? The current literature suggests that pregnant women occupationally exposed to pesticides face an increased risk of miscarriage and that their children are at greater risk of birth defects and impairment of fine motor skills, visual acuity, or short-term memory. It has recently been shown that such children are also at significantly higher risk of developing leukemia or brain tumors. The children of women living near agricultural zones or exposed to pesticides in household settings are likewise at increased risk of birth defects. Reports indicate that such children suffer neurodevelopmental disorders and have a significantly increased risk of leukemia. Specific pesticides, now no longer in use, have been unequivocally linked to reduced male fertility. Whether pesticides currently in use produce similar effects remains unclear. Does combined exposure to multiple pesticides pose a special risk? Communities today are generally exposed on a permanent basis to low doses of pesticides and other chemical substances; the health effects of such exposure are still difficult to predict and remain a key question within the domains of toxicological research and pesticide risk assessment. We should stress that, in general, the phrase “the evidence is inconclusive” does not necessarily indicate the total absence of risk. If we have come to recognize the definite health risks associated with certain pesticides, this simply reflects the extensive research that has been carried out on the products in question; many other active ingredients may pose similar threats but simply have not been subjected to the necessary epidemiological studies. What measures does the study recommend? The authors find it essential that current data regarding occupational exposure to pesticides, as well as corresponding information from previous years, be examined more closely. In addition, investigators should focus their attention on exposure during “critical periods” (during development, for instance), among those who are occupationally exposed as well as the population at large. Multi- and transdisciplinary research initiatives are also vital, as these would facilitate swifter identification of the potential dangers and risks associated with exposure to the active ingredients in pesticides.